If you want to maximise the use of space in your home, the key is to create a living space in your garden by choosing stylish garden furniture. From wood and plastic to stylish rattan direct from a specialist retailer, there is an enormous selection of beautiful furniture to choose from. If you're not sure what to look for when picking new furniture for your outdoor spaces, this is the ultimate guide to making an informed purchasing decision. Here, you'll find helpful tips about what to keep in mind when making your final choice, and what to be aware of before selecting the right pieces for your garden. One of the first considerations you need to keep in mind when choosing garden furniture is the type of climate that you live in. For example, if you live in a dry and hot environment, wooden furniture would be a bad idea since it can crack and splinter in these weather conditions. If you live somewhere known for its strong winds, plastic or aluminium will not stand up to the gusts, whereas if you live in an especially damp environment, wicker is a poor choice since it cannot withstand regular expose to moisture. There's no point in choosing some beautiful furniture only to find that it's far too big for the space you have available. Look carefully at the space you're trying to fill and measure it first before making your choice. Using the shape and area of your garden, patio or balcony to help inform your purchasing decision makes sense, but don't forget that you'll need some extra room around the furniture to allow you to walk around it comfortably. Since outdoor furniture comes in all shapes and sizes, you're sure to find something that fits perfectly in your space, whether that be a cafe style table and chairs, a large dining set or a stunning full-scale sofa and coffee table set like those supplied by Rattan Direct. Another factor to keep in mind is where the furniture will be placed in your garden. Will it be on the grass itself, it will it be on a patio or hard surface? If you're choosing soft wood furnishings or wicker, for example, moisture from grassy surfaces and exposed areas will eventually cause rot to set in. Metals are also a poor choice for damp grounds since they can corrode. Although garden furniture is available in a wide range of materials, such as wood, metal, plastic, wicker and rattan, you need to consider not only appearance, but also weather conditions and how much maintenance you're prepared to put in when making your decision. While materials like resin, teak and aluminium are easy to care for, some woods require a lot of upkeep with regular varnishing and oiling required. If you're looking for beautiful furniture which will stand up to regular outdoor use, rattan is a good choice. 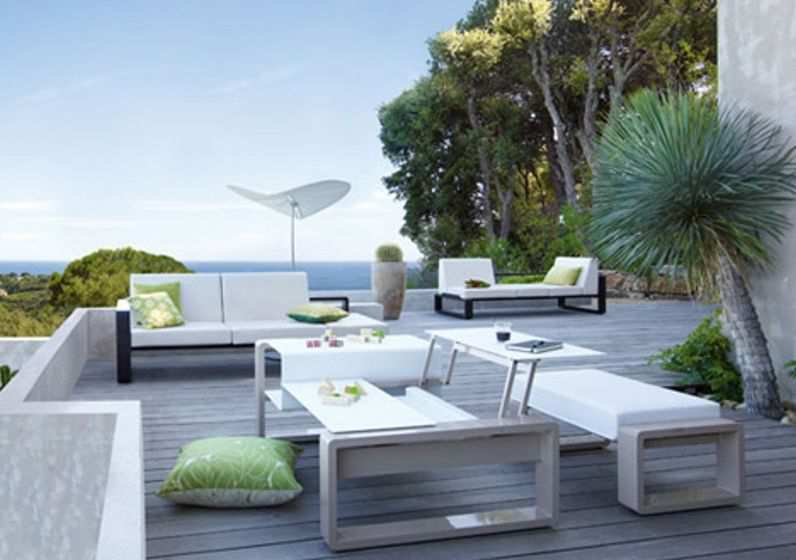 Your garden furniture is extending your home outdoors, so you will want it to be comfortable and inviting. Choosing good quality, cosy sofas, such as those available from Rattan Direct, will ensure that you get the most out of your outdoor spaces, since relaxing in your garden is the chief reason for making your purchase, while weatherproof bean bags, softly padded recliners and swinging hammocks are also wonderful choices for total relaxation. While it would be wonderful to just be able to buy any furniture that takes your fancy, unfortunately, budget is almost always a consideration. If you don't want to break the bank but still find some stylish furniture that looks beautiful and ensures optimal relaxation while in your garden, you will need to do your research thoroughly to make sure you are getting the best value for money. The good news is that there are many affordable garden furniture options which don't compromise on style, practicality or durability. If you make an informed choice, you'll be able to enjoy many years of excellent service from your gorgeous new outdoor furnishings, and you just won't be able to wait for the next sunny day! If you're keen to find some beautifully crafted furniture that is sure to give your garden an elegant and sophisticated appeal, visit Rattan Direct and discover stylish sofas, tables, chairs and accessories that will give your outdoor space a facelift.